BACKGROUND AND PURPOSE: Although Guglielmi detachable coil (GDC) endovascular treatment of intracranial aneurysms has become an accepted alternative to surgery, the main complication continues to be thromboembolic events. We sought to determine the frequency and radiologic appearance of thromboembolic events during GDC embolization for asymptomatic cerebral aneurysms by using diffusion-weighted (DW) MR imaging and to determine whether aneurysmal anatomic factors or use of the balloon-assisted technique affected the frequency. METHODS: In 74 patients, 79 asymptomatic cerebral aneurysms were treated with GDC embolizations at the National Cardiovascular Center from 1999 to 2001. Thirty-nine of these aneurysms (49%) were treated with the balloon-assisted technique. DW imaging was performed in 66 patients at 2–5 days after GDC embolization. All DW images were reviewed by two radiologists for depiction of abnormalities. RESULTS: DW images showed hyperintense lesions in 40 patients (61%), with 16 of these patients (40%) incurring neurologic deteriorations. Fifteen of the symptomatic patients (94%) fully recovered by discharge, and the remaining one experienced permanent deficits. Hyperintense lesions were detected more frequently in wide-neck (73%) or large (100%) aneurysms and in procedures that used the balloon-assisted technique (73%) than in small aneurysms (50%) or in procedures with the simple GDC method (49%). The occurrence of new lesions was significantly associated with use of the balloon-assisted technique and with aneurysm diameter in multivariate analysis (P < .05). CONCLUSION: In our experience, thromboembolic events related to the use of GDC embolization are relatively common, especially in wide-neck or large aneurysms or in association with the balloon-assisted technique. Although permanent deficits are rare, the high rate of thromboembolic events suggests that improvements in the technique such as the addition of antiplatelet agents and the development of new embolic materials are mandatory. The endovascular treatment of an intracranial aneurysm by using Guglielmi detachable coils (GDCs; Target Therapeutics/Boston Scientific, Fremont, CA) was first introduced by Guglielmi et al in 1991 (1). Since then, GDC treatment has undergone rapid change, and recent advanced techniques make it possible to improve anatomic and clinical outcomes (2–5). Although this treatment has become an accepted alternative to surgery, thromboembolic events still constitute the main complication (6, 7). A previous study showed that thromboembolic events occurred at a rate of 28% after GDC treatment, with 5% of these patients having permanent deficits, and a significant number of the symptomatic patients showed no radiologic abnormality (6). Experimental and clinical studies have revealed that diffusion-weighted (DW) MR imaging allows sensitive and early detection of cerebral ischemic lesions (8–10). Of note, a recent study with DW imaging reported a high frequency of asymptomatic embolism in 61% of patients after GDC treatment, and the rate of embolization was shown to be independent of the number of coils used (11). However, because of the relatively small size of the study, the frequency and causative factors of thromboembolism remain uncertain. For example, the detection rate may be dependent on inherent differences in specificity and sensitivity of the radiologic techniques and on differences in the complexity of GDC procedures such as balloon-assisted techniques. The purpose of this study was to evaluate by using DW imaging the frequency of thromboembolic events with endosaccular embolization of consecutive asymptomatic aneurysms and to compare the radiologic findings with those of clinical examinations. We reviewed clinical and angiographic outcomes and the frequency of thromboembolic events after GDC treatment and analyzed the risk factors for the development of thromboembolism. Between January 1999 and May 2001, we performed endosaccular embolization with GDCs for 74 patients with 79 asymptomatic cerebral aneurysms at the National Cardiovascular Center, Osaka, Japan. Eighteen patients were male and 56 were female. The patients’ ages ranged from 33 to 77 years (average, 57.9 years). Sixty-nine patients were identified incidentally for an unrelated medical condition, and five patients were identified at cerebral angiography for subarachnoid hemorrhage after evaluation of ruptured aneurysms. All ruptured aneurysms were treated within 2 weeks by means of surgical clipping. Surgical clipping is the reference standard treatment for cerebral aneurysms, and from this point of view, the GDC treatments were undertaken for a strictly limited number of patients for the following reasons: aneurysms considered to be difficult to treat surgically (72 aneurysms), elderly patients (two patients, >70 years), patients who refused conventional surgery (three patients), and patient’s medical condition (two patients). Patients were informed of the alternative therapies and signed consent forms. The aneurysm locations were basilar bifurcation (n = 22), basilar artery-superior cerebellar artery (n = 4), vertebral artery (n = 2), vertebral artery-posterior inferior cerebellar artery (n = 1), internal carotid-paraclinoid segment (n = 46), internal carotid cavernous portion (n = 2), and internal carotid bifurcation aneurysms (n = 2). Seventy aneurysms were small (diameter < 10 mm), and nine were large (diameter 10—25 mm). Fifty-five aneurysms had small necks (neck diameter < 4 mm), and 24 had wide necks (neck diameter > 4 mm). The method used for such measurements has been published previously (12). GDC procedures were performed via a transfemoral route with local anesthesia and mild sedative agents as necessary and with systemic heparinization to maintain activated clotting time at 2–2.5 times the baseline throughout the procedure. Because the intervention was usually performed with use of local anesthesia, neurologic status of the patient could be assessed during the procedure, allowing early detection of thromboembolic complications. General anesthesia was selected for one patient because of anticipated incoordination. All flushed saline and contrast medium were heparinized (1000 IU/100 mL), and both a guiding catheter and a microcatheter were placed to a continuous heparinized drip. In cases of wide-neck aneurysms (neck diameter > 4 mm or dome-to-neck ratio < 1.5) or large aneurysms, balloon-assisted techniques were performed. In some small-necked aneurysms, modified balloon-assisted techniques were used to fix the tip of the microcatheter located in the sac of the aneurysm, which allowed suitable deposition of GDCs (13). All treated aneurysms were evaluated angiographically after embolization by our neurovascular team. The results of the embolization were classified into complete occlusion (no filling of aneurysmal rests without neck remnant) or incomplete occlusion (small neck remnant or partial occlusion). All GDC procedure records were reviewed for the number of GDCs, total coil lengths, and procedure time. In all cases, systemic heparinization was not reversed, and the patients were transferred to a neurosurgical intensive care unit and received intravenous infusion of antithrombin agents for 2 days and oral antiplatelet agents for the following 3 months postoperatively. MR imaging was scheduled at 2–5 days after the GDC procedures. The imaging was performed with a 1.5-T system (Magnetom Vision; Siemens, Erlangen, Germany) by using a multisection, single-shot, spin-echo echo planer imaging sequence. Diffusion gradients were applied in each of the x, y, and z directions with two b values (0 and 1000 s/mm2). Imaging parameters included a TE of 100, field of view of 23 cm, matrix of 96 × 128, section thickness of 4 mm, and intersection gap of 2 mm. Conventional spin-echo imaging also was performed at each examination in T1- and T2-weighted conditions and with a fluid-attenuated inversion-recovery (FLAIR) sequence. All MR images were reviewed by either of two neuroradiologists (N.Y., S.I.) who were unaware of clinical information. If DW imaging abnormalities were detected, their number, location, and size were recorded. The association of new hyperintense lesions with aneurysm diameter and with use of the balloon-assisted technique were tested with multivariate analysis by using logistic regression. A P value less than .05 was considered to indicate a statistically significant association. Seventy-four GDC embolizations were performed for 79 aneurysms in 74 patients, including five patients harboring two aneurysms treated as one procedure. In this series, 39 aneurysms (49%) were treated with a balloon-assisted technique. Fifty-nine (75%) of 79 aneurysms were completely occluded, and 20 (25%) were incompletely occluded. The rate of complete occlusion depended on aneurysmal anatomic factors such that 45 (83%) of 54 small aneurysms with a small neck, nine (56%) of 16 small aneurysms with a wide neck, and five (56%) of nine large aneurysms were completely occluded at the initial procedures. There were 23 symptomatic complications. Seven patients experienced minimum deficits (slight motor weakness in six, disorientation in one) during the intervention and fully recovered by the end of the procedure after anticoagulation and volume expansion or thrombolytic therapies or both. One patient developed slight motor weakness due to acute thrombosis of the middle cerebral artery during the procedure and was treated with intraarterial infusion of urokinase (120,000 IU). Neurologic deficits in the remaining 14 patients persisted after the procedure: Complete recovery occurred within a few days in six patients and during the following 1–3 weeks by discharge in five patients, and three patients (4%) were discharged with permanent deficits. In one patient with a wide-necked internal carotid-paraclinoid aneurysm, the coil mass protruded into the internal carotid artery, causing thrombus formation. Emergency stent placement was performed to put the protruded coils back into the aneurysm. With anticoagulation therapy, the symptoms fully improved. One patient (1%) died of vessel rupture associated with the balloon-assisted technique. Permanent morbidity and mortality rates were 4% and 1%, respectively. DW imaging was performed in 66 patients after the GDC procedures, and the frequency and distribution of new hyperintense lesions were assessed by the two neuroradiologists (N.Y., S.I.). For the remaining eight patients, postprocedural DW imaging studies were not obtained because of patient refusal or periprocedural death due to vessel rupture. In 40 (61%) of 66 patients, new hyperintense lesions most consistent with acute embolic cerebral injury were detected. Sixteen of the 40 patients with positive DW imaging findings demonstrated neurologic complications. Overall, 16 symptomatic (24%) and 24 silent (36%) thromboembolic events occurred in the 66 patients after 66 procedures. No new lesions were detected on DW images in three symptomatic patients (4%), as described below. The occurrence of hyperintense lesions on DW images after the procedure depended on the anatomic configuration of the aneurysms, such that the abnormality was detected in 50% of small aneurysms with a small neck (22 of 44), 73% of small aneurysms with a wide neck (eight of 11), and in 100% of large aneurysms (seven of seven) (Fig 1A). In addition, the hyperintense lesions were detected at 73% (22 of 30 patients) after the procedure with balloon-assisted technique, which was more frequently than with the simple procedure (50%, 18 of 36 patients) (Fig 1B). In the remaining four patients with two aneurysms treated during the same procedure, hyperintense lesions were seen in three. Graph depicts frequency of hyperintense lesions on DW images after the procedure according to A, anatomic configuration and B, procedure performed without (BAT-) or with (BAT+) the balloon-assisted technique. Gray bars indicate symptomatic embolisms; striped bars, silent embolisms; S/S, small aneurysm with small neck; S/W, small aneurysm with wide neck; L, large aneurysm. The numbers of new lesions were one to three in 21 patients (34%), four to five in seven (11%), and more in nine (14%). Twenty-six patients (41%) showed no new abnormalities on postprocedural DW images. Three of them experienced neurologic deterioration after the procedure. One patient with associated arteriovenous malformation complained of decreased ipsilateral visual acuity as a result of microembolism to the central retinal artery. The remaining two patients complained of partial seizure during the procedure and a visual field defect, respectively. Both patients fully recovered immediately. In 36 (90%) of 40 patients with new hyperintense lesions, the lesions were located in the vascular territory downstream from the treated aneurysms. One patient (2%) had new lesions in the vascular distributions remote from the treated aneurysm. Three patients (8%) showed abnormalities in several different vascular territories, including that downstream from the treated aneurysm. Twenty-seven (41%) of the 66 patients showed small lesions (<5 mm) in the subcortical white matter at the border zone or perforator regions, including five symptomatic cases with transient neurologic deteriorations. In 13 patients (20%), large territorial infarctions (>5 mm) were detected. Eleven patients experienced neurologic deteriorations but recovered with volume expansion and anticoagulation therapies by the time of discharge. One patient had permanent deficits. The frequency of new hyperintense lesions showed a significant association with aneurysm diameter (P < .01) and with use of the balloon-assisted technique (P < .05). Greater availability and improvement of neuroradiologic techniques have resulted in more frequent detection of unruptured aneurysms. The surgical treatment of unruptured cerebral aneurysms is controversial. Since the overall surgical outcome for ruptured aneurysms remains unsatisfactory, preventive radical clipping or endovascular surgery is considered as an alternative strategy (2, 14). The endovascular technique contributes to the overall treatment of patients harboring incidental aneurysms (3). Technical complications associated with the use of GDCs include aneurysmal perforation and rupture, parent artery occlusion, cerebral embolism, coil migration, vasospasm, and hemodynamic ischemia with inadequate collateral reserve (2). 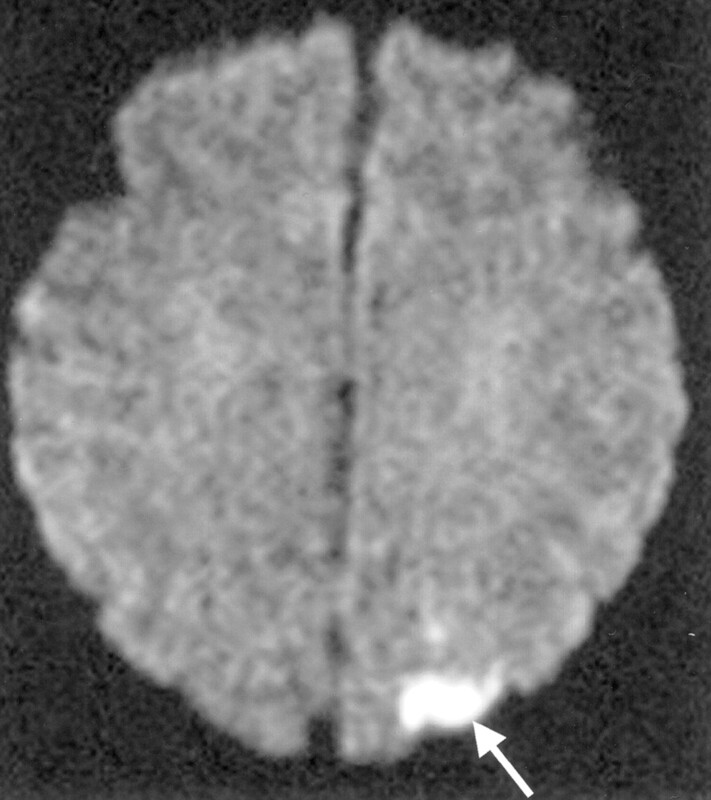 The largest contributor to complications of GDC treatments is iatrogenic brain ischemia caused by thromboembolic events (1–7, 11). This may be caused by thrombus formation from the catheter or guidewire, from the thrombosis in the aneurysm sac, or from herniation of the coils into the parent vessel. Although clinical thromboembolic complications have been reported to occur in a range of 1.0% to 28%, the complications in these studies were defined as new focal deficits, a change in mental status, or abnormalities at postprocedural CT or conventional MR imaging (1–6). One transcranial Doppler study showed that microemboli after endovascular embolization were seen more frequently in patients with symptomatic cerebral ischemic events (71%) than in those with asymptomatic ones (21%) (15). In our series, the clinical complication rate was higher than that of previous studies (1–5), because most previous studies reported the frequency after the procedure in which general anesthesia was used, raising the possibility that they might have missed a minor complication during the procedure. On the other hand, the embolization procedure with local anesthesia allows evaluation of the patient’s neurologic condition during the procedure and the early detection of neurologic deficits as well, making timely and appropriate use of thrombolytic therapy possible (16). The present findings incorporated small clinical and radiologic abnormalities and demonstrated a precise complication rate. DW imaging appears to be the most sensitive technique for detecting early and small ischemic lesions. In an experimental model, DW imaging accurately depicted abnormal insults within 40 minutes from the onset of ischemic stroke (9). In clinical studies, these abnormal lesions persisted for at least 5 days (8, 10, 17). T2-weighted and FLAIR images were unable to show early ischemic stroke or to discriminate acute from chronic infarcts (10). Recent DW imaging studies report that silent thromboembolic events occur not only in endovascular surgery but also in diagnostic angiography (7, 11, 18, 19). Rordorf et al (11) suggested that thromboembolic events related to GDC techniques may be more common than what has been reported; in fact, silent embolism occurred in 61% of the 14 cases in their study. On the other hand, one MR imaging study suggested that silent infarcts were strongly associated with cognitive impairment, and it might not be a true “silent embolism” without detailed neuropsychologic testing (20). For safer neurointervention, it is necessary to evaluate procedure-related thromboembolic complications, including not only symptomatic but also apparent asymptomatic ones. GDC treatment is effective with an acceptable morbidity rate for small aneurysms with a small neck owing to the high initial success rate and low mortality and morbidity rates (2–3). In wide-neck and large aneurysms, however, the combined use of the balloon-assisted technique enables a denser packing of aneurysms and markedly improves the anatomic results after the treatment (4–5). Some authors report that the occurrence of thromboembolic events with the use of the balloon-assisted technique is not different from that of the conventional GDC technique (4, 13). However, this technique requires sophisticated handling, frequent use of guidewires and microcatheters, the need for temporary occlusion of the parent vessel, and repeated inflation and deflation of the balloon. Use of the balloon-assisted technique is theoretically a risk factor for thromboembolic complications (5, 6), because the risk of significant emboli will likely increase with increasing procedural complexity, potential sites for the generation of microemboli increase, and longer procedure time. On the other hand, the process of intraaneurysmal clot organization in large aneurysms is delayed and incomplete (21), and it may cause delayed postprocedure ischemic events. Derdeyn et al (22) reported that larger aneurysm diameter and protruding loops of coils are risk factors for postprocedure ischemic events after GDC treatment. The current results show that the occurrence of thromboembolic events depended on the procedural complexity, such as larger aneurysms (P < .01) and the use of balloon-assisted techniques (P < .05). Therefore, in the case of wide-neck or large aneurysms, we have to balance the risk of thromboembolic events and the better anatomic outcome associated with the balloon-assisted technique. There are many possible sources for embolic events during GDC treatment of cerebral aneurysms, including friable plaques and iatrogenic dissection in the parent vessels, air bubbles, and thrombus or fresh clots within aneurysms and catheters (2, 11, 18). On the other hand, the location of the lesion depends on both the flow patterns in the patient’s brain and other unresolved factors. The various patterns of hyperintense lesions were shown in the present study. 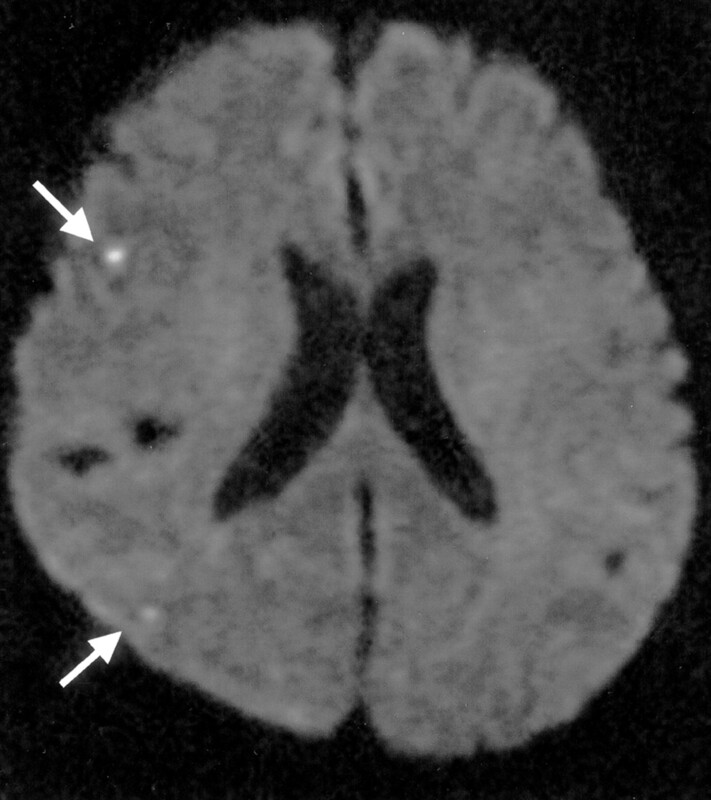 Twenty-seven patients showed small lesions (<5 mm) in the subcortical white matter of the border zone or perforator regions (Fig 2). Most lesions were located in noneloquent areas and were undetected on initial CT scans, with only five cases experiencing transient neurologic deteriorations. The brain border zone is a favored destination for microemboli because this area has an inadequate blood supply, and once the blood supply is disturbed by microemboli, this area might fall to infarction (19, 23, 24). Thromboembolic complications can be initially silent, becoming symptomatic only when the infarct enlarges. In 13 patients, large territorial infarctions (>5 mm) were detected with both conventional MR imaging and CT in incorporated eloquent areas, and 10 of those patients experienced neurologic deteriorations (Fig 3). Silent embolism in a 63-year-old woman with right internal carotid paraclinoid aneurysm. DW image of the brain obtained 3 days after GDC embolization shows subcortical border-zone infarcts (arrows) in the right hemisphere. Symptomatic embolism in a 64-year-old woman with basilar bifurcation aneurysm. DW image of the brain obtained 2 days after GDC embolization shows cortical infarcts (arrow) in the left occipital convexity. New hyperintense lesions were not always located in the vascular territory of the aneurysm’s parent artery (Fig 4). It is suggested that they originated from collateral flow such as that from the anterior or posterior communicating artery or from diagnostic angiography of other vessels. An important aspect to be considered is that complications can also arise during diagnostic angiography before the GDC procedure (7, 18). 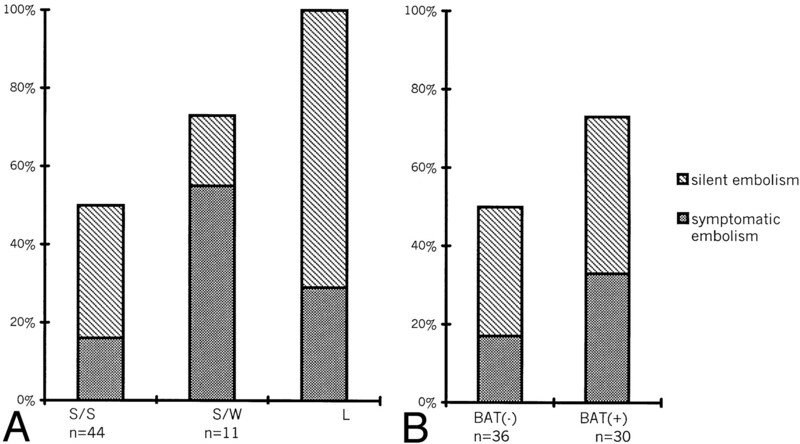 Bendszus et al (18) reported that a silent embolism related to diagnostic angiography occurred in 26% of their cases. Their embolic lesions were located in the distal vascular territory of small cortical, subcortical, or perforating vessels. Silent embolism not located in the vascular territory of the aneurysm’s parent artery in a 65-year-old woman with basilar bifurcation aneurysm. A–C, DW images of the brain obtained 2 days after GDC embolization show cortical infarcts (arrows) in the cerebellar hemisphere (A) and frontal (B) and parietal (C) convexities. In our institute, systemic heparinization is not routinely reversed, systemic anticoagulation with Argatroban is continued for 2 days after the procedure, and the patients are administered antiplatelet agents orally to prevent late embolic events. The high rate of thromboembolic events identified with DW imaging in the present series suggests that the present protocol is insufficient. Therefore, a more effective antithrombotic regimen such as intravenous or per os antiplatelet agents should be considered before and/or during treatments, especially in patients with wide-neck or large aneurysms, in whom the necessity of balloon-assisted techniques or longer procedure time is anticipated. In our experience, the infarcts related to the use of GDC embolization are more common sequelae in wide-neck and large aneurysms or with use of balloon-assisted techniques than in smaller aneurysms or with use of simple GDC treatments. Although permanent clinical sequelae are rare, the high rate of thromboembolic events suggests that alternations in the technique, such as the addition of antiplatelet agents and development of new embolic materials that could be packed by means of simple methods, should be considered. Experience, attention to procedural details, proper patient selection, and measures to reduce the rate of symptomatic and silent embolisms may permit safer aneurysm treatment in the future. Accepted after revision August 14, 2002. Carotid-compression Technique for the Insertion of Guiding Catheters.